(Växjö, Sweden) – Galvin Green – the world’s leading maker of high-performance and functional golf clothing for serious players and the No. 1 global golf partner of GORE-TEX® – announces the launch of the EDGE capsule collection crafted for the modern, style-conscious golfer. The exclusive EDGE range features 3D patterned bomber jackets, camo polo shirts, sweatshirts, bandanas and more available at select golf shops and TrendyGolfUSA.com. Three years in the making, EDGE is composed of 16 contemporary garments and accessories themed in a fashionable camo look featuring unique color combinations of black, grey, green and red. The line covers most of the brand’s pioneering multi-layers, designed to help golfers play in all weather conditions. In addition to matching camo belts and caps, the collection includes shell layer waterproof jackets, windproof Interface-1 tops, warm Insula sweatshirts and cool Ventil8 Plus shirts and pants, retaining all the renowned Galvin Green technical performance benefits. The shell layer is highlighted by the E-LLUSION, a waterproof GORE-TEX® full-zip jacket in a striking 3D pattern with mesh lining, a lightly padded collar and subtle branding on the chest and back of collar. The lightweight E-TRIANGLE IRON jacket features GORE-TEX® Paclite Technology stretch fabric in a tailored fit with an extra-light padded collar. 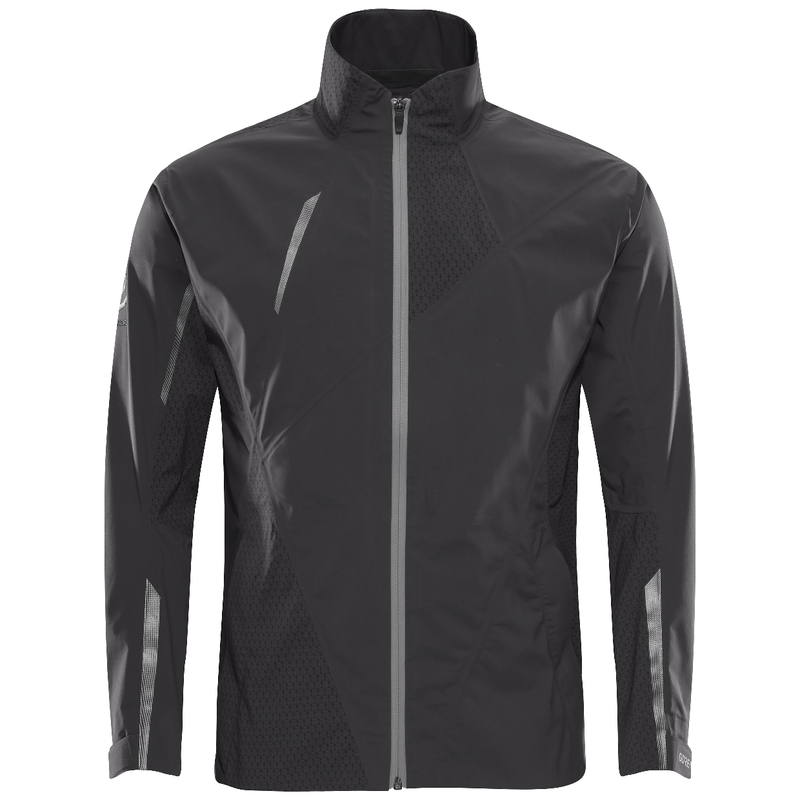 Additionally, the EDGE Interface-1 hybrid jacket offerings includes the E-GOLF BASE jacket with two-way front opening for a full-zip or button-down option plus a quilted collar with rib cuffs and hem; and the E-CAM PRINTED full-zip jacket with double layered collar, rib cuffs and hem, front pockets and red accented wind panel. Three Insula jackets are included within the range – the black E-INSULA PATCHWORK, the E-INSULA WAVE half-zip pullover with an eccentric black and white design and front kangaroo pockets, and the E-INSULA GG LOGO sweatshirt that sports a front cell phone pocket and EDGE chest logo. Complementary E-BLACK Ventil8 pants with a bold white stripe are a standout item of the line along with Ventil8 Plus polo shirts E-EMPFLAGE in camo with stripes, E-CAMONOIR with contrast collar and sleeve trim, and E-THE WHITE and E-THE RED shirts. Completing the line are the E-CAMO belt, two E-CAPS in red and green, and an E-CAMO bandana. Galvin Green is also the Official Team Supplier of Weatherwear for the 2018 European Ryder Cup Team. Through this partnership, the company will provide its premium outerwear garments to the captains, vice captains, team members and their caddies during the matches at Le Golf National. Part of the brand’s esteemed Multi-Layer system, the outfit includes a GORE-TEX® fabric shell layer and an Interface-1 hybrid jacket. Learn more at www.GalvinGreen.com. Get social at www.Facebook.com/GalvinGreen and @GalvinGreen with #staycool #stayahead.